Louis Oosthuizen returns to Lake Karrinyup Golf Club with fond memories of his 2016 victory in the Perth International, which has been replaced a by a new tournament format. 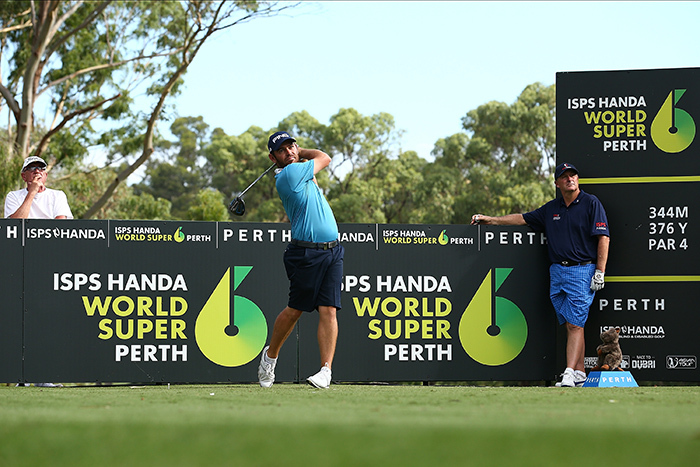 Dubbed the World Super 6, the four-day tournament begins in regulation fashion, with 156 players aiming to make the 36-hole stroke play cut. On Saturday the field will play for position before a further cut to 24 players for the Sunday action, which is a six-hole matchplay showdown. Pairings will be randomly drawn. Ties will be decided by sudden death holes, and the leading eight players at the end of Saturday’s play will receive a bye and go straight into the second round of matchplay. All knockout matches will be played over six holes, being the tenth (par four), second (par four), eighth (par three), 11th (par five), 12th (par three) and 18th (par four). These are subject to change. His good memories of the course, including a Friday round of 64 last year, will be crucial in getting through the first section of stroke play. The 2010 Open Champion finished third at the Waste Management Phoenix Open a fortnight ago and is clearly swinging well. The new format presents some challenges, but Oosthuizen’s timeless ability makes him a contender for the title. ‘I’m very curious to see on Sunday how everyone plays and how it’s going to happen, but I’m looking forward to it. I think golf needs changes and it’s great to just see people coming up with new ideas,’ he concluded.